“Necessity is the mother of invention”. That’s not an uncommon saying. But “mother nature inspires wonderful office interiors”, is a rare one. Or is it? Let’s go back half a step and ask a curlier more expansive question – where do great interior designs come from and what will be trending over the coming months and years? Don’t worry, I’m not going to answer with a blithe, “depends” and leave it at that although, there are some factors that need to be considered when staring into the commercial office fit out crystal ball. Elsewhere in our collection of powerhouse group articles you’ll find various pieces on things to consider before you consider which fit out company to use. All of them will, at some point, talk about what is needed from the chosen interior design. What role does the space have to fulfil and for whom and why and when and how? Clearly the answers to these questions form the basis of the functionality portion of the brief but what of aesthetics, branding, feel? They are also, very, very important and it is this aspect that either receives too much weight or too little depending on the client. Understanding, establishing and then bringing to life that crucial balance is all about knowing where to place that design fulcrum. Experienced teams will know where that goes and what the tipping point will be because they know that solving problems is the key to good design and that the placement of the design fulcrum (that establishes the correct balance) is high on the real priority list. The argument is not so much about timber over polished concrete, primary palette over secondary or L-shaped workstations over rectangular sit/stand desks. The focus needs to be on balancing elements to create a lasting, on-brief, design solution that works. If all these factors form the skeleton of a well-wrought design solution, again, the question remains, where does the flesh come from? And, to the point of this article, what will it look like? Well, here are three points thoughts to ponder. Having sorted through the questions in the previous section, a perceptive and imaginative interior designer might then look to your brand, your logo, your reputation and aspirations. 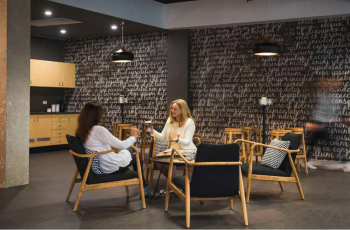 Capturing the character of a business is certainly one of the keys to successfully creating a workplace that people will enjoy and feel at home in. However, conveying the right message to visitors and customers also has its place. 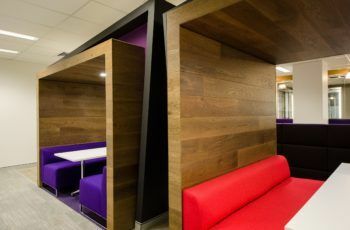 A garish reception area flowing through to the staid confines of a business that prides itself on a measured approach to long term strategy would be at odds with the character and function of the workplace environment. However, timber and stone, for example, may add a timeless air to a tenured company that pillars its engineering community. Likewise, a progressive tech initiative may demand openness, transparent surrounds with an eye on the future and collaborative synergies – think glass, open plan, line of sight, innovation. Adaptability and an openminded approach to design is key here. There’s nothing quite like putting on an exquisitely tailored jacket. Forget for a moment what wearing a jacket might mean to you and or the perception of you within your profession or social set and think about the look and feel. To achieve that look and feel, the tailor will have asked several questions based on expert observations they have made. Which colour combinations might best suit your body type and stature, evening or day wear, social or business, style and so on, which materials and textures will accentuate your “look”? When the finished jacket settles gently over your shoulders and the fabric falls just so, you’ll realise that it fits like a glove because it was made specifically with you in mind. It will feel just right because it is right. And people are very comfortable with people that are comfortable in their own skin and in their workplace. That’s the result we’re looking for and so that’s the approach we take because making people feel at home while at work, is most certainly an emerging trend. Personally, I’m inspired by nature. Not just the majesty of sprawling vistas, mountains and the oceans but also how various biospheres work within the environment. It’s no secret that my passion is exploring and enjoying the natural wonders on offer across Australia and many of these experiences have inspired design and functional solutions used in much of my work. A natural sensitivity and curiosity toward the environment are valuable assets to designers and as we continue to push the envelope, creating new, never-before conceived looks and ideas, nature will always serve as a muse. Interior designs that bring us closer to the natural world as opposed to consistently striving to create a world that distances itself from it, are often successful at drawing people to the brand. The not-so-secret secret is that we already acknowledge that for the most part, nature works. Bringing nature together with functional and aesthetic imperatives within commercial interior design is a welcome endeavour, one which continues to find favour with a broad array of clients. Happily, I’m not alone in this thinking, which means that this idea will probably be an enduring one. 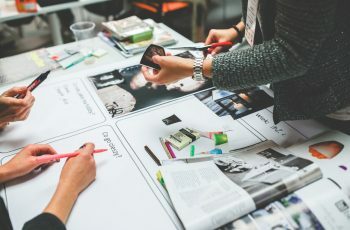 It’s folly to specifically, to attempt complete accuracy by outlining exact details of future trends but these ideas certainly point us towards the thinking that, I believe, will drive them.